Here you can see the most exciting game (fourth round, first board) from the 9th Annual Cup of consul general of Japan (in Saint-Petersburg, Russia): Alexander Dinerchtein (Black) vs. Ilya Shikshin (White). The game was broadcasted by EuroGoTV on KGS, and it reached 470 observers. As always in his recent games, Ilya played the two-stars opening as White, allowing Alexander to try an interesting fuseki (moves 1+3+5). Ilya has a very powerful and sharp reading ability, and he likes to fight very much. So, in the past, Alexander's strategy when playing him would be to keep the game "as simple as possible", in order to beat him in yose (which apparently used to be easy for him; not anymore). Ilya kept his cool throughout the game, always waiting for his chance to strike. Combat is his natural environment, and he can always come up with surprising plays, like the G9 tesuji (move 208). 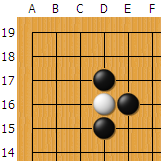 After that, Black's position started collapsing. He did manage to live at the left side, but anyway he was behind by 20+ points in the end, so Alexander eventually resigned. Recently, Alexander is having a hard time winning against Ilya Shikshin, although his overall score against him is still quite good. It seems that beating Europe's Lee Sedol is an almost impossible task now for other European players. what a strange game. b seemed to have an easy win going. .. Sorry, the broadcast was faulty. Actually, that move was Harry's only slip, but I had to redo that sequence again in the original file. The move I was referring to was R9. It is corrected now, thanks. By the way, about that move: it seems that Cho U 9p likes it very much. He played it many times in official games, with a very high success rate (88% according to my database).